Jambalaya is a wonderful choice for a party when you need to feed a lot of people or just when you need an extra boost of fun to start your week. Hi friends!!! I am so excited for the first post of this week: Jambalaya! I love trying new cuisines, and Louisiana Creole is one I’d love to explore more, especially because jambalaya is so amazingly delicious: a warm bowl of tender chicken, hot andouille sausage, and fresh shrimp cooked with celery, onion, bell peppers, okra, and tomatoes in a sauce spiced up with Cajun seasoning. Even better, there is no wheat needed, making it a perfect dish for us gluten-free people. If you’ve never had jambalaya before, you are seriously missing out. And if you are already a jambalaya fan and have never made this dish at home, this is the recipe for you. The origins of jambalaya are open to debate. According to the New Orleans Official Guide, The Dictionary of American Food and Drink says the dish was created when a traveller showed up at a New Orleans inn late one night, hours after dinner had been served. The owner of the inn told the cook to “balayez” (throw something together) as a meal for the traveller. The meal ended up being mouthwateringly delicious, and so jambalaya was born. What Ingredients will you need to make Jambalaya? Regardless of how it came into existence, jambalaya really is quite simple to prepare if you follow several easy steps. First, sauté the celery, bell peppers, onion, and garlic in a little olive oil. Once the vegetables are soft, add a little more olive oil, and then the chicken and Andouille sausage. Andouille (pronounced an-DOO-ee) is a spicy sausage usually made from smoked pork. However, be sure to buy gluten-free sausage as sometimes sausages can have fillers. 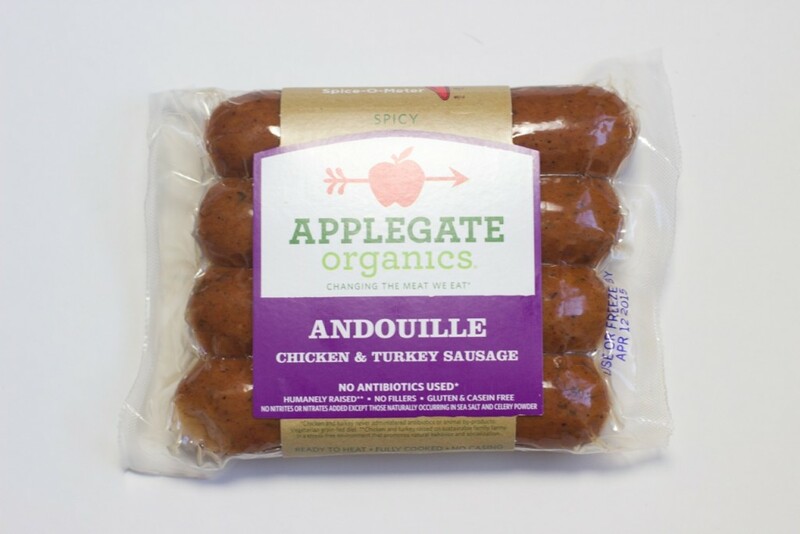 The andouille sausage by Applegate are gluten-free and made with chicken and turkey. Willshire Farms are also gluten-free and made from pork. Both are very good. After sautéing all of the ingredients for about another five minutes, stir in the tomatoes, bay leaf, Cajun seasoning, and thyme. Reduce the heat to low, cover, and let simmer for about twenty minutes. Then add the pink shrimp and okra. The pretty star-like seed pods of the okra have a thick, gooey mucilage that aid in thickening the sauce. Let the beautiful, brown sauce continue to simmer until the shrimp is cooked. The most distinctive feature of jambalaya is undeniably its spiciness. However, how spicy you end up making this dish is entirely up to you. For those of you who are not big on spicy, I think this dish would still be quite tasty on the mild side. However, if you love your jambalaya so spicy that your eyes water, you can add jalapeño peppers with the vegetables in the beginning, then cayenne pepper flakes when you add the other spices, and even a teaspoon of Sriracha at the very end when the dish is done cooking. My family tried it both ways, and we found that the cajun seasoning and spicy andouille sausage were hot enough for us. Jambalaya is traditionally served with rice. I recommend this gluten-free spicy jambalaya rice mix from Zatarains. All of my kids loved it. However, John and I have been trying to follow the principles of a paleo diet, so we decided to try the jambalaya with cauliflower rice instead. This is a great option if you are cutting back on carbs, and it makes a wonderful substitute for rice. You can find my recipe for cauliflower rice here. It turned out beautifully with the jambalaya. Jambalaya is such a celebration of flavors and spices. It’s a wonderful choice for a party when you need to feed a lot of people or just when you need an extra boost of fun to start your week. Heat 2 of the tablespoons of olive oil in a large skillet over medium-high heat. Add celery, onion, bell peppers, garlic and (jalapeño, optional). Saute for 5 minutes, stirring until the vegetables are soft. Add the remaining tablespoon of olive oil, chicken and sausage, and stir to combine. Continue sauteing for an additional 5 minutes. Add the tomatoes, bay leaf, Cajun seasoning, thyme, and (cayenne,optional) and stir to combine. Reduce heat to medium-low, cover and simmer for 20 minutes, stirring occasionally. Then add shrimp and okra and stir to combine. Continue to simmer, stirring occasionally, until the shrimp are cooked and no longer pink, 5 minutes Remove bay leaf and season with salt and pepper. Jambalaya is traditionally served with rice. I recommend this gluten-free spicy jambalaya rice mix from Zatarains. All of my kids loved it. If you are cutting back on carbs, cauliflower rice makes a wonderful substitute for rice. You can find my recipe for cauliflower rice here. It turned out beautifully with the jambalaya. Oh my goodness, that looks delicious!! I would definitely have to tone it down to very mild – neither hubby or I like really spicy food – but everything else in this dish…YUMMY!! Thanks for sharing! Thank you K. Lee. This recipe is pretty mild except you may want to try a different sausage. Andouille sausage is a bit spicy. I love jambalaya. I made a super quick version last night…but I’ll be trying your recipe too! It’s such a fun dish. 🙂 Thanks, Michelle. Thanks so much, Raia. I appreciate you so much.